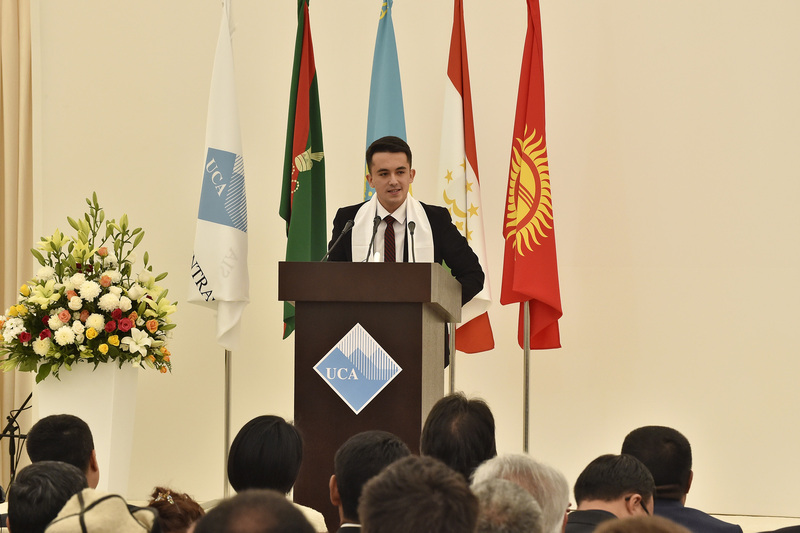 Eraj Uzoqov, representing the students of the first class at the Naryn campus, addresses the inauguration ceremony. My name is Eraj Uzoqov and I am honoured to deliver this speech on behalf of the inaugural class of 2021. Only six weeks ago, we set foot on the University of Central Asia’s first campus in the mountains of Naryn. I remember seeing pictures of the university online and I was truly certain they had been photo-shopped. We all had, a hard time believing the pictures we saw online because we never thought that a university of this level would be found within the mountains of Central Asia. I remember the first day we arrived on campus, we were all in awe at how beautiful our university was. I am sure that we all will cherish this moment for the rest of our lives. When you are born and raised in Central Asia, you think that you know the region well, but after being here, I have realised just how much I need to learn. For instance, my roommate Nurlan lives in At-Bashy, about one hour from here and I live in Dushanbe, about 24 hours from here. In just six weeks we have become so close that he invited me to visit his home. His family introduced me to Kyrgyz culture and they have showed me a side of Central Asia I have never seen before. Studying at this campus, I have met people from Kyrgyzstan, Tajikistan, Kazakhstan and also I have met people from other mountain regions such as Afghanistan and Pakistan. Even I am from Tajikistan, I never thought I’d have the chance to meet people from other regions of my home country. Not only are my classmates diverse, our faculty and staff at UCA, are also from different parts of the world. They come from as far away as Canada, United States, Philippines, Germany, Azerbaijan, Pakistan and as close as Kyrgyzstan, Tajikistan and Kazakhstan. Your Highness, you have spent years advocating for pluralism and diversity around the world, and I truly believe that this Naryn Campus is an embodiment of your vision. As beautiful as the mountains are around us, they have physically divided people in Central Asia for hundreds of years. This has posed a large challenge to our region. However, being at UCA we have realised that education can unite people despite the physical boundaries and altitudes of the mountains. Some of my classmates and I have grown up in the cities and we were aware of the challenges of the mountains. However, this didn’t impact us until UCA provided us with an opportunity to learn about the challenges, not only through our interdisciplinary curriculum but also by learning, living in the mountains and gaining first-hand experience. This has made us think critically about how we, as a new generation, as a future generation of Central Asia, can turn these challenges into assets of Central Asia. We have been here for just a month and a half and we have already seen the progress within our academic and non-academic skills. We have developed our English proficiency and our strengths in communication skills and we have developed our independence, and confidence and we are taking more responsibility with various aspects of our lives. Even though the transition has been challenging, the support we are getting from both faculty and our Student Life team has made it smooth and easier. We, the inaugural class of 2021, realise that while we enjoy the benefits of this campus, we also carry important responsibilities with us. Each of us is responsible for taking the knowledge we receive here and applying it to the larger world. We have a responsibility to serve the people who reside not only in our local communities, but also those across the globe. We pledge to follow Your Highness’s vision of what a global citizen should be as we begin this journey of education and discovery. Your Highness, we are incredibly grateful to you and the Founding Countries of this University for providing us with an opportunity to expand ourselves and our minds at UCA. We are very thankful for everything you have done and continue to do for creating opportunities for mountainous regions such as ours. Honorable Prime Minister Jeenbekov, we would like to express our gratitude for allocating this beautiful land as our home for the next five years. On behalf of the students, I would like to thank everyone who has made this possible for us as members of the Inaugural class of the University of Central Asia. We sincerely hope you enjoy your time here in the midst of the mountains we call home and we look forward to seeing you again in five years’ time at our graduation ceremony.